The DENNISONs of this patrilineage who came earliest to America were evidently Scotch-Irish, since they first appear on the western frontiers of Pennsylvania and Virginia in the 1730s and 1740s, and bear the characteristic Scottish given names of this group, as well as the original Scottish form of the surname: “Denniston”. With the addition of two new project members (D-12 and D-13) whose ancestors, possibly brothers, emigrated from Ireland to Canada about 1825, we have for the first time, definite evidence of an Irish origin for this patrilineage. Both these DENNISONs emigrated from Ireland to Canada, not the US, one of them (somewhat oddly) from Cork, at Ireland’s southernmost tip, and the other from County Leitrim in the north, near Ulster. There is also circumstantial evidence that these two had both a third brother and a father who also emigrated to Canada from county Leitrim, and there are records for a DENNISON family in Leitrim which match all the Canadian immigrants in a general way. The DENNISONs of Ireland and Scotland have been extensively researched by new project member Barry Bradfield, who has shared with me much of his evidence, the most exciting single piece of which for current project members is the record of two children baptized to Daniel and Margaret Dennison of St Mary’s Dublin: an Andrew, baptized in 1721 who died the same year, and a Daniel baptized 15Jun1722. Since this latter record corresponds almost exactly with my estimate (say 1720) of the birth date of Daniel, son of Daniel Denniston of Beverley Manor, and given the comparative rarity of the surname, this piece of evidence from surviving Dublin parish records may well be the “smoking gun” descendants of the SW Virginia lines have been looking for as a guide to further research in Ireland. Only the name of the Dublin wife is wrong—the immigrant Daniel’s wife was named Sarah—but a far-flung emigration to the western wilderness of America, and a much later second marriage there, would go a long way toward explaining why Daniel Denniston of Beverley Manor appears to have had only two surviving children. Although I have seen a few DENNISONs in the records of the western PA counties (Chester, then its derivative counties, Lancaster and York, and later in the far western counties of Washington and Allegheny) I think it likely that all the other tested project members so far (besides these new Canadian ones) descend from one of two related families who settled in the westernmost VA county of Augusta by 1760. And even though the two family heads, Daniel and John, probably came first to PA, they appear to have left no trace there in the records. The pioneer immigrant to Virginia, Daniel1 Denniston, the ancestor of members Alan-05, Randle-22 and several other Pat 1 project members, purchased land in heart of Augusta County, Virginia, in 1739, and was one of the first few hundred settlers of upper Valley of Virginia. Daniel1 and his descendancy are covered by my report “The Daniel Dennistons of Beverley Manor and Descendants”, and many descendant lines have also been tracked by member Randle Dennison’s book, listed in the project bibliography. Two other project members, Scottie-06, and MaryJane-34, appear to descend from the one grandson of Daniel1, John3, who remained behind in AugustaCo when his father and all of his brothers, decamped for KY in the 1790s. However, until now, there has been insufficient evidence to establish their relationship convincingly to each other or to John3. I have now accumulated sufficient evidence, and will amalgamate their pedigrees into the Daniel1 indented tree, and publish a supporting report for that in the near future. In addition, I have recently concluded that the other AugustaCo pioneer immigrant, John1 DENNISON, was the ancestor of long time project members Lane-01, Russell-07, and John_A-04, as well as new members Reda-48 and Rita-49. The descents of all of these people run, I believe, through John1’s son, Robert2 of WashingtonCoVA. I’ve been researching this John1 line sporadically over the years and have recently extended this research significantly and comprehensively enough to make it worthwhile to post, like everything else on this site as a work in progress, a comprehensive descendancy of John1, and I’ve pulled together all of the detailed evidence supporting my conclusions, which I will turn into a set of comprehensive reports, as I find the time for this. As those who are familiar with the conventions of this project page know, one can link to the specific lineage of a project member by clicking his/her project number wherever it appears as an active link. In addition, as a convenience, I’ve also added a set of direct links to the descendancies of Daniel1 and John1 near the top of the navigation panel in the top left of this page. The two principal Closer Cousin Clusters (CCC)s of this patrilineage, the DANIEL1 and the JOHN1 CCCs, both descend from mid-1700s immigrants to Augusta County, on the SW Virginia frontier, but both almost certainly came into the Americas through Pennsylvania, the principal colony of entry for the Scotch-Irish, as well as for the minority of Scottish ethnics who came directly from Scotland. Neither of these immigrants appear to have left any paper trail in Pennsylvania, though, which is quite typical, in part because most of the early tax records of LancasterCoPA are lost. However, for every ten early Virginia immigrants of ultimate Scottish origin, there were probably about four who remained on the then western Pennsylvania frontier, rather than undertake the long and arduous trek down into SW Virginia. I’ve long known of these several sets of DENNISONs who remained in PA, most of whom spelled their surname with the Scottish “t”, and it now appears that we have a Patrilineage 1 project member of that ilk: Levi Deniston (D-50). Levi’s yDNA haplotype shows that he is not a particularly close relative of descendants of either of the Virginia DENNIS[T]ON immigrants, Daniel1 and John1. Rather he appears to have a fairly close affinity with the Mainline Irish CCC. Inspired by this new PA acquisition, I’ve now completed my compilations of DENNISON abstracts of the most comprehensive early Pennsylvania records: the land grant records, and the township tax and military records abstracted in the Pennsylvania Archives Series 3 volumes. I had already compiled all the DENNISONs in the USCensuses from 1790-1820 for Pennsylvania and all the states to its west and south. All of these compilations are linked under “DENNISON Genealogical Resources & Evidence” on the main umbrella DenSPA page. I’ve also put together a report covering Levi’s DENNISTON ancestry in OH and PA, based on the more specific evidence that has been found for his line, interpreted against the backdrop of my more comprehensive PA compilations. Levi’s lineage traces back to the James Deniston who headed the only household in YorkCoPA (east of the mountains) in 1790. This is one of the first records for Levi’s line and it’s interesting that his surname, Deniston, has retained its exact original spelling. As for the western PA DENNIS[T]ONs, our Irish genealogist, Barry Bradfield, has accounted for the largest set of these stemming from one Arthur Dennis[t]on who settled in WestmorelandCoPA about 1773, and who, with his sons (John, Alexander, William, and Archibald), took out warrants on much land, both there, and a bit farther to the west in Allegheny and derivative counties as these were carved out of the raw frontier. This Arthur was the son of one John Denniston of NewBrunswick, MiddlesexCoNJ, who in turn appears to have migrated from County Leitrim, Ireland, where the DENNISTONs of Patrilineage 1 had quite a large presence. Barry has assembled much of the probate and vital records evidence concerning this family, which nicely complements my compilation of land grant and tax records. The principal items missing are the deeds, and perhaps other local court records that this family presumably participated in. I would hope and expect that in time a descendant of these western PA DENNISONs will turn up in the project and confirm that he too belongs to DENNISON Patrilineage 1. In his research in Ireland, Barry has also come across an interesting 1789 letter home from one John Denison who settled in HuntingdonCoPA to a brother Samuel who lived in County Down, in Northern Ireland; this John appears only once, though, in the comprehensive compilations of early PA records that I’ve made—on the 1788 tax list for Tyrone Township in HuntingdonCo, taxed for 166a, 3 horses, and two cows. As expected from this and his letter he also heads a HuntingdonCo household in the 1790 USCensus for PA, but had removed elsewhere by 1800. There is a well-known family of early New England DENNISONs, descended from William Dennison, baptized 3Feb1571 in Bishop’s Stortford, Hertfordshire, who migrated to RoxburyMA in 1631, and we do now have one project member of this patrilineage with a solid descent from this William, and their yDNA, which matches that of at least one other tested descendant who is not a member, is entirely different from that of the Scottish Patrilineage 1 DENNIS[T]ONs. Beyond that, most of the many American DENNISON families who appear in the early USCensus records for New York, are probably of English origin. Few spell their surnames with a “t”, and as the surname distribution maps on the DENNISON Surname page indicate, the vast majority of British DENNISONs are of English, not Scottish or Irish origin, though presumably a few of these might have migrated south from Scotland over the centuries. Unfortunately, we have as yet no DENNISON member descendants with NY origins. Scottish BALFOURs are of interest to this project because one of its yDNA-tested members is named Patrick Balfour—meaning that his ancestral line at some point experienced an NPE (Non-Paternity Event) that changed his biological surname from DENNISTON to BALFOUR. In my analysis of the BALFOUR CCC that Patrick shares with project member Russell Dennison (and likely with several other project members who haven’t, like Patrick and Russell, extended to 111 markers), I’ve come up with an estimate that, based on the set of 111-marker yDNA haplotypes accumulated thus far in the project, the MRCA (Most Recent Common patrilineal Ancestor) of Patrick and Russell, presumably a DENNISTON, was born say 1600, give or take a generation or two—thus between, probably, 1525-1675. The next question is where. Patrick-32’s Balfour grandfather Jack immigrated to Canada from Belfast, Northern Ireland, in the 1880s, after Jack’s father Peter was born in Greenock, Renfrewshire, Scotland, not far from the great port of Glasgow in Lanarkshire to the west. Although I haven’t subjected Patrick’s ancestry to quite the rigorous evidential scrutiny I usually bring to bear, I have validated it in the Scottish census back as far as that goes (1841), when Jack’s great-grandfather William, born 27Jan1799, was a resident of Greenock. Patrick claims three more generations rooted in Glasgow, and though he has shown me no evidence for any of this ancestry, he has specific marriage dates back to William of Greenock born 1799, and specific birth dates back to William Balfour, weaver of Glasgow, b.29Dec1734. I have provisionally accepted his lineage thus far because presumably somewhere back of these claims are either local parish records, or perhaps some sort of private record preserved within the family. The ancestral tree that Patrick sent me also claims a couple of generations back beyond William the weaver. William, it says on Patrick’s ancestral chart, was the son of one John Balfour, born in Edinburgh Sep1684, who married there on 24Oct1717 one Esther Liddle. This John was said to be a “wright”—perhaps a wheelwright or some other sort of mechanical engineer. But no evidence or argument is offered for this father-son relationship and there is much here to explain: Why and when did John migrate to Glasgow? Did he really father a son at age 50? And why does the son have a completely different occupation from the father? Although, as usual with surnames, one can expect there to have been a number of different (unrelated) patrilineages that share the surname BALFOUR, both due to NPEs and to the fact that many Scots didn’t assume permanent hereditary surnames until the 1700s or even later, and when they did, they often chose the names of local lairds or other prominent people they respected. However, it’s quite clear from a pair of surname distribution maps based on the 1881 UKCensus that the predominant BALFOUR surname patrilineage, and almost certainly the most ancient, originated in the Scottish county of Fife. Thanks to the glacially slow pace of internal migration in Great Britain (other than a steady drain to the few big regional cities, and except for the very most common names, like SMITH and JONES who are everywhere), these maps tend to be reliable indicators of the counties where the main surname patrilineage(s) originated, and show also by the graduated shadings, the directions in which they spread out from there into adjacent or nearby counties. The first map shows the Balfour concentrations by county, adjusted for the population of that county, which factors out the tendency of all surnames to concentrate in the major cities (in this case Glasgow in Lanarkshire, and Edinburgh in Midlothian). 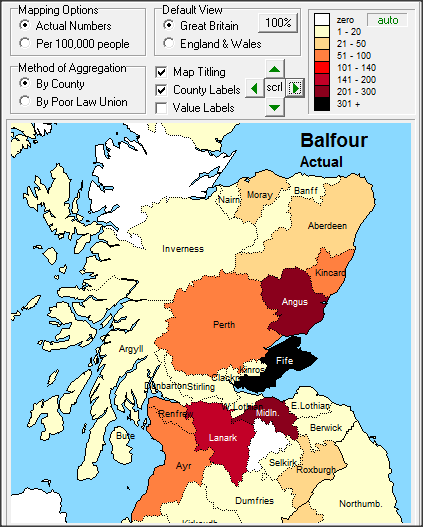 The second map shows the actual numbers of Balfours in the counties of Scotland, and is perhaps even more indicative of the locational history of this patrilineage. For both maps, I’ve chopped off England and the southern part of GB because there are relatively few Balfours there and because we know in this case that project member Patrick-32’s BALFOURs came from Scotland. From 1707 to 1841 the Scottish population increased by a factor of 2.5 and by 1881 to almost 4 times the 1707 figure, with, presumably, a particular drift to the big cities of Edinburgh and Glasgow. We know from Patrick’s genealogy that his people were among the minority of BALFOURs in Refrewshire from 1841-1881, and that they were inhabitants of Glasgow, Lanarkshire, by 1734 when his ancestor William the weaver was born there. In 1841 there were only 30 Balfours in Renfrewshire, so differentiating Patrick’s family at that stage is easy. However, there were 119 Balfours in Lanarkshire by 1841 (about half in Glasgow), and 119 in Midlothian by 1841 (the majority in Edinburgh), and interpolating from the demographic statistics, there were probably about 20 Balfours in Glasgow at the time William the weaver was born, and about 30 in Edinburgh, whence William’s putative father John (born 1684) is supposed to have come. These numbers translate to just a few BALFOUR families in both places, so exhaustive research of the town records of Glasgow and Edinburgh has a fair chance of turning up evidence that John of Edinburgh relocated to Glasgow as Patrick thinks (if he did), or of contradicting this proposition (if he didn’t). According to The Balfours of Pilrig (1907), by Barbara Gordon Balfour-Melville (or BOP for short), John Balfour, born 1684, was the son of James Balfour of Edinburgh (say 1653 - abt 1702). This book by a descendant of James, traces James’s BALFOUR ancestry fairly credibly back another six generations to one Alexander Balfour of Inchrye (say 1468 - say 1515), in Abdie Parish, northern Fife. Although BOP is an old-timey genealogy, thus naturally fails to meet modern scholarly standards of evidence and citation, it appears to have been well researched in both primary and secondary records, and I would be inclined to post this BALFOUR lineage for Patrick if there were some evidence linking his earliest known ancestor, William the weaver of Glasgow, with this John Balfour who supposedly removed from Edinburgh to Glasgow. Be that as it may, it’s quite likely that Patrick connects in some way to this BALFOUR lineage that originated in Fife, and had later representation in Edinburgh. A great deal of genealogical research has been done on the ancient Scottish gentry family of BALFOUR, and some evidence has been found regarding possible points of convergence between BALFOURs and DENNISTONs in the right places, but there is way too much on this to even summarize here. I’ve accordingly put together a paper, “Possible BALFOUR-DENNISTON Connections in Scotland”, that examines this evidence in some detail, taking account of the wider BALFOUR background. The indented descendancy trees below have been carefully vetted for plausibility, and are backed by citable evidence drawn from readily available sources like the USCensus; from items listed in the upper left navigation panels of the DENNISON Surname Project main page and of this Patrilineage 5 Project page; or from other, more particular sources detailed in the headnotes to the descendancy trees below—much of this more particular evidence is available on request from the principal genealogists whose names are listed in those headnotes or in the project Directory of Researchers where they are linked through their project numbers to their particular ancestral pedigrees. Each descendancy begins with the earliest known male ancestor of a particular sublineage and continues down to the ySTR DNA tested male descendant. Since this DNA patrilineage project is focused on tested or testable males surnamed DENNISON, these descendancy trees have generally been pruned not only of daughters, but also of most male lines that are known to have gone extinct or “daughtered out”, though in some instances all the sons, or even complete reconstructed families including daughters, will be included because of their broad-based genealogical interest; in such cases where sons are known or believed to have no living male descendants, this mill be noted one way or another, e.g. “no known children”, or “died unmarried”. The information provided for each male DENNISON should be sufficient in most cases to uniquely identify him in the USCensus and other readily available sources. These data comprise (insofar as is known): date and place of birth, date and place of death, the name(s) of his wife (or wives) and the date and place of marriage. The parents of the wife may be identified, e.g. Mary KING d/o (daughter of) John & Margaret. The posted lineages have been severely abbreviated and standardized to facilitate eyeball scanning and CTL-F searching. Partial dates that are not backed by specific, unequivocal evidence are always qualified: approximate dates by “abt” guesstimated dates by “say”; or otherwise by “bef”ore, “aft”er, or “btw” (between), depending on the evidence. Approximated dates imply supporting evidence which merely fails of complete accuracy, while “say” dates are guesstimates based on typical patterns of the time, place, and social group. Full specific dates posted prior to Mar2018 were truncated to just the year, but since then I’ve begun posting such dates in full and expanding certain earlier posted year dates to their full form as they have come to my attention. I’ve changed my earlier policy because full specific dates have their own inherent plausibility, and because they are strongly suggestive of specific evidential backing, but I’ve attempted to preserve the distinction between dates for which I’ve actually seen the evidence, and full dates that have merely been claimed by others, by enclosing the latter (merely claimed) dates within [square brackets] and sometimes appending a “?” when they seemed particularly doubtful. Places have been abbreviated to the most important jurisdictional place where relevant records are to be found—for most states/colonies these are counties; for New England, towns. A standardized, coded, format has been used to represent jurisdictional places to facilitate scanning or CTL-F searching: ZIP codes represent US states/colonies; 3-character codes (like “ENG”) represent other countries; and the elements of a jurisdictional place designation have been concatenated to save space. Thus, for example, “Augusta County, Virginia”, has been standardized as “AugustaCoVA”. The yDNA-tested male descendants are flagged below with their Project#s and the Nickname of the Principal Genealogist, e.g. Alan-05). Inferences about the placement of the distinctive yDNA mutations of project members have been interwoven with their descendancies, below, in red text; please note, however, the careful qualifications in these DNA notes where they appear. Most inferences drawn from DNA evidence are probabilistic in nature and one needs to keep an open mind about alternative interpretations, just as one does with the genealogy itself. Doubtful ancestral links to conjectural sons are outlined in the color “tomato”, e.g. |. Sources: Alan Denison, Randle Dennison (see RD), and John Robb (see JBR-DENNISON). Chris Dennison’s line has been attached, below, to that of Wiley4 (David3, Daniel2, Daniel1), and he, Randle, and John Robb, are the sources for that. However, based on Chris’s DNA results, there is virtually no chance that he descends from the immigrant, Daniel1. Chris has been placed here simply because it still appears that Wiley4, and an unknown portion of his descendancy, does belong here, and it facilitates analysis to keep this line together for now. and are shared by all his tested descendants so far except Chris-23 who lacks DYS576-. | | | | ---m. 1862 Theresa Callie HUBER, in KnoxCoIL; sons Silas H. (1865), Amos L, Leven W.
| |--3-Isabella Helena Denniston (1765 - bef 1833) m. Hamilton ATCHISON Sr.
| | | | | | ---m. Frances Victoria ALBIN; son: Benjamin Scott Jr.
and Lane Teaff with material on Scott’s son James. and DYS570+ marks the sub-branch of John Allen-04, Reda-48, and Rita-49. downstream of Scott3 so may have limited applicability. will hopefully turn up better mutations for defining the clusteras a whole. | | To help fill out Robert2’s large and problematic family I’ve included his likely daughters. | | | | | Gerald Bruce, William Boyd, Scott, and George W.
| Robert2, James2, and John2 were all on the WashingtonCoVA tax lists for 1782. | James2 was gone for good by 1786. Source: Levi Deniston, and John Robb (see Ancestry of Levi, and USCensus records for D-50). The mutation DYS446- may link this line to that of several lines of Irish origin, below. and elsewhere)and Elaine Baker, who is a direct descendant of 2-James. The mutations DYS439- and DYS446- link this line to several others of Irish origin. on the Dennistons of County Tyrone, Ireland, and possible relatives. Sources: Barry Bradfield, whose extensive research on this line is presented in his paper “Ronald Denniston of Longford”. Despite the title, this paper covers also the descendancy of Ronald’s American cousin Wayne Denniston (project member #19), and both Wayne and Ronnie of Ireland have assisted with information on their particular lines of descent. The mutation DYS446-, shared by Wayne-19 and Barry-25(Ronald) links them also with their cousins Barry-13(Robert), and Barry-12(Sidney), who likely descend also from Alexander or his close kin. The mutations DYS446- & CDYb+ shared by Wayne-19 and Barry-25(Ronald), are consistent with their common descent from Alexander’s great-grandson, Samuel Denniston (c1744-1804), of County Longford. A man’s yDNA may be classified according to a deeper, broader, ancestral tree schema by testing ySNPs instead of ySTR markers. These ySNPs are unique point mutations to the yChromosome that occur so much less frequently than ySTR mutations that they are of no use in sorting people into patrilineages, but by the same token they are ideal for sorting patrilineages into the various haplogroups and subclades of the broad human population. And by correlating the haplogroup subclades of both modern descendants and of their ancient ancestors (by testing their remains) with geographic population flows, and with archaeological evidence signifying cultural groupings, the whole broad history of homo sapiens is gradually being reconstructed. Each SNP mutation represents a further branching of the human tree, defining a new subclade. DENNISON Patrilineage 1 falls in the broad classification of Haplogroup R1b, and within that into one of its two main subdivisions, defined by the mutation U106. This branch of the human population tree is therefore referred to as “R-U106+”, where “R” stands for Haplogroup R, and the “U106” for the most recent known SNP mutation in a particular descendancy. The “+” at the end means that additional SNPs have been found to have occurred downstream of U106 in the genomes of some members of the R-U106 subclade, and that these SNPs haven’t yet been tested for. Or, if all the next level SNPs had been tested for a particular individual and found to be negative (i.e. that no further known mutations had occurred subsequent to U106), the haplogroup subclade for that individual would be termed “R-U106*”. The U106 mutation itself is estimated to have occurred about 3650 years ago, give or take a few centuries. For a very detailed and technical analysis of both the DNA and the archaeological evidence pertaining to R-U106 (in the context of other haplogroups), see this publication by U106 guru, Iain McDonald. R1b, the broader subclade into which R-U106 falls, is the most prevalent haplogroup in northwest Europe, and in all its varieties it is shared by about 65% of all those with patrilineal British ancestry. R-U106 follows the main line of R1b, but it has a bit more of a Continental background than its main alternative line, R-L21, which is especially prevalent amongst the Celtic population of Ireland and Scotland. R-U106 accounts for about 25% of European haplotypes, and 21% of English haplogroups (though only 5.9% of Irish—there are no statistics for Scotland), but it is even more prevalent in the Netherlands (37.2%), Germany (20.5%), and Denmark (17.7%)— or in a word: Frisia. These are precisely the areas of Europe from which the Anglo-Saxon tribes staged in their takeover of England. Consequently, while Britain is today predominantly Celtic in its DNA (at least on the male side), the DENNISON Pat1 DNA probably represents a different, more Germanic strain. The most recent SNP that marks this DENNISON Patrilineage 1 line for which I’ve been able to find any commentary is R-Z306. According to the Wiki for R-Z306, the Z306 mutation may have occurred any time between 500-1500 BC, and descendants of this group are particularly concentrated in the part of Frisia that is today known as Belgium. Belgium fronts the English Channel coast just to the east of France, and at the neck of ancient Doggerland land bridge than ran from the Continent to Britain until about 4500 BC when the melting glaciers after the most recent ice age raised the sea levels and buried it under the waves. Since Z306 occurred much more recently than that, it may have been carried to Britain across the channel by the Anglo-Saxons who came in some numbers to southern Britain about 300 AD in the wake of the Romans. However, since the roots of this DENNISON patrilineage lie in ancient Scotland of about the 12th century, the emigration of the patrilineal ancestor of all of these DENNISONs may have been much later, and from a more northeasterly starting point, though still probably from Frisia. We now have Big Y test results for two members of DENNISON Patrilineage 1: for Alan (D-05), and for Barry(Ronald) (D-25). The Big Y test samples all or many of the ySNPs, and so is able to associate or differentiate descendants on the basis of much more recent ySNPs that are unique to their lineages and much closer to the present—perhaps extending down into the period of genealogical time. As a result of these Big-Y tests, DENNISON Patrilineage 1 is now known to be positive for the following chain of descendant ySNP mutations within Haplogroup R1B (in order of descendancy): U106, Z381, Z156, and Z306 (also Z305, Z307, and S1667 whose exact order of precedence isn’t known). Patrilineage 1, is uniquely negative for Z304, and instead has the mutation R-BY3237. The ISOGG version of the R Haplotree knows not of this mutation, and continues to hypothesize, incorrectly, that Z304 falls into the same set of mutations as Z305-Z307, for which the order of precedence is not known. These two BIG Y results for DENNISON Patrilineage 1 show that the Z304 mutation occurred more recently than any of these others, and after the patrilineage that includes this DENNISON line split off from the R Haplotree. What we do not know is when the unique ySNP mutation that marks this patrilineage (R-BY3237) occurred, but presumably it was no earlier than the 13th century or so when DENNISON (“Danzielstoun”, later “Denniston”, etc.) was adopted as a permanent hereditary surname for this patrilineage. The Big Y test reports matches to numerous other Big Y testees surnamed PITTMAN and BOWES, whose current ySNP profile differs from that of the two tested DENNISONs only by being Z304+ and BY3237-. For what it may be worth, the 1881 UKCensus shows the surname PITTMAN concentrated in and around Dorset in the SW of England, while BOWESes are heavy in the north of England, particularly in Yorkshire, Cumberland, and Durham. There are no PITTMANs in Scotland, however, and only a smattering of BOWESes, with the largest concentrarion in Ayr. The second Big Y test (the one for D-25) also picked up one additional ySNP that differentiates between him and D-05: this ySNP has apparently been christened PF682 (at least this is my interpretation of the Big Y Results Matching page headings, which are a bit ambiguous). Although we don’t know exactly when this ySNP mutation occurred either, since it presumably happened after the divergence between these two sublineages, probably some 10-12 generations ago, it may prove useful down the road (when more members have tested on Big Y) in sorting out tested DENNISON descendants, just as the ySTR tests have. SW Virginia... Pennsylvania... New England, etc. at 37 markers? ... at 111 markers? See the DenSPA page for links to other DENNISON evidence. This project is in no way affiliated with the DNA testing company, Family Tree DNA or any of its surname projects. Rather, the members of this independent patrilineage project are also members of the independent DENNISON Surname Patrilineages Association (DenSPA). Some Key Terms: CCC, haplotype, haplogroup, NPE, patrilineage, RPH. Active researchers of this DENNISON patrilineage are shown below. Those with highlighted names may be e-mailed by clicking on their names, and their posted descendancies may be viewed by clicking on their highlighted Patrilineage Project#s. Satellite members of the project are listed immediately after the principal researcher for the sublineage they are interested in, and their names are preceded by a dash. Where the person tested is not also the principal researcher, the former’s name appears under the latter’s, in parentheses. This project has several qualifications for membership. If you are interested in becoming a member, please read through the following text and contact me by clicking the “Email JBR” button at the top right of this page if you believe you qualify. First, membership is open only to active genealogists who have taken or sponsored a Y-Chromosome (ySTR) DNA test of a male surnamed DENNISON on a sufficient number of markers to show that his haplotype broadly matches the Root Prototype Haplotype, as shown in the haplotype chart for this project. At present, only the 37-marker test offered by the testing company, Family Tree DNA, is unequivocally adequate for definitive patrilineage classification, but those who’ve tested their Y-Chromosome at Ancestry.com and who fit the RPH more loosely may be able to upgrade to 37 markers or otherwise qualify for a definitive classification: if you are in this boat, please contact me and I’ll be glad to evaluate your Ancestry yDNA results for you, though I’ll probably recommend upgrading. Those who haven’t yet tested the Y-Chromosome of a male surnamed DENNISON, but who believe, on purely genealogical grounds, that their DENNISON ancestry fits within this patrilineage, can order a qualifying 37-marker Y-Chromosome (ySTR) DNA test directly from Family Tree DNA. Except for when one of FTDNA’s occasional sales is going on, the best price for this test ($149) can be obtained by ordering a test while joining one of the FTDNA surname projects. For example, one could apply to join the FTDNA DENNISON surname project, and place the test order on acceptance. Please note: this DENNISON Patrilineage 1 Project has no affiliation with FTDNA and membership in the FTDNA Surname project is not required for membership in this independent patrilineage project. The other qualification for membership in this project is a willingness to share for posting to the project web pages both the specific results of your test, and an ancestral DENNISON pedigree derived from your research, backed by your name as principal genealogist for your line, and by an email address, so that you can be contacted for further sharing by other project members—or, for that matter, by other interested genealogists who come across the project pages on the web, and find something that resonates with their own lineage. The DENNISON ancestral pedigree that I’ll ask you to submit if your yDNA test results match the pattern for this patrilineage, should show each generation back from the person tested to the earliest DENNISON ancestor for whom you have convincing documentary evidence. The specifics of what’s needed are explained in the head note to the Descendancies section of this project, though the specific format doesn’t matter since I’ll have to hand code it into HTML anyway, for posting. I’ll also encourage you to provide copies of, or links to, the few pieces of evidence (other than the USCensus) that you’re likely to have for your most problematic ancestral generation—usually the earliest. As a professional genealogist, I’ll then take a close look at your submitted pedigree, and do some validating research myself to ensure that what’s posted is well-founded. There’s all too much genealogical flotsam and jetsam floating around the internet and it is our objective in this project to confine what we post strictly to what is evidence based. I will also try to come up with recommendations for additional research you might undertake to strengthen your pedigree or push it farther back, at least to the point where it converges with one of the established branches of this patrilineage. This is meant to be a project for active researchers with a keen interest in their DENNISON lineage, and once you’re a member, and thus known to have a patrilineal connection with all the other members, you are encouraged to contact any whose lineages offer special promise of converging with yours, and perhaps to organize collaborative research undertakings with them. You can contact a principal genealogist member by clicking on their full name in the project Directory of Researchers. You may also be able to identify and recruit potential new members for testing who might be distant cousins of yours—patrilineal descendants whose ancestors trod approximately the same ground at about the same time as your ancestors. However, there’s little or nothing to be gained by testing known close cousins, for the simple reason that their genealogical connections are already known. On the DNA side, this DENNISON Patrilineage 1 project is a large one with many members who’ve extended their 37-marker test results to the full 111 markers offered by FTDNA, and it may prove genealogically valuable for you to do likewise. The more markers that are tested, the more chances you have of turning up mutations that you have in common with certain other members, and in most cases where this happens, just the DNA alone can classify you as belonging, with them, to a Closer Cousin Cluster (CCC), a particular family sub-branch within the patrilineage. Knowing your CCC can focus your attention onto the genealogical byways most likely to yield the evidence you need to confirm and/or connect your pedigree to one of the larger and deeper indented trees. As project coordinator, and a yDNA expert, I’ll be available to advise you about these further implications and possibilities regarding your DNA and your closer patrilineage cousins. Finally, if you would like to join the project as the principal genealogist representative of your particular DENNISON ancestry, but are a female, or a male whose surname isn’t DENNISON, you will have to find a DENNISON male to test for you, as your surrogate. The only things your surrogate need do are to: (1) agree to service the cheek swab kit that will be mailed out to him and drop it in the mail; and (2) consent to your use of his yDNA results haplotype for the genealogical purposes of this project. Ordinarily, we would also want to identify him by name to preclude confusion with others with the same name, but if desired, his name can remain anonymous. In any case, your (and your male cousin’s) posted ancestral pedigree will post only the names for ancestors born after 1900. As for your yDNA test results (haplotype) that I’ll analyze for you and post, since it’s a product of sampling portions of the Y-Chromosome that have no known genetic function, the only meaning to be derived from the set of 37 two digit numbers (markers) that make it up, is that the person tested belongs to a patrilineage whose common ancestor lived, in most cases, many hundreds of years ago. There have been a couple of sensationalized reports of misguided law enforcement officials mining public genealogical databases for aid in tracking down criminal suspects or fugitives, but even the most extended 111-marker Y-Chromosome (ySTR) DNA haplotypes fall far short, not only of being able to establish particular identities, they don’t even provide more than weak probabilistic evidence that the suspect in question has any sort of close relationship to the person tested: even with perfectly matching 111-marker haplotypes, any two members of the patrilineage, say a criminal suspect and an innocent project member, might just as well be 6th cousins, say, as brothers, or father and son. Thus, even in the unlikely event that you might be related through your patriline to a “person of interest” to the authorities, ordinary conventional methods, such as querying the many ordinary online databases that have been compiled on all of us, are going to be far more effective in tracking down particular individuals. On the other hand, what yDNA testing can show definitively is that a male who is ostensibly the descendant of a line of JONESes, is not, in fact a JONES of this line all the way back, because somewhere up the ancestral tree a Non-Paternity Event (NPE) must have occurred, causing a divergence between the surname line and the biological line. There’s no telling just from this one yDNA test where the divergence occurred, though by testing a number of other ostensible descendants of this line, one could in principle narrow down the possibilities to just a few generations. Even so, because these yDNA tests are not in themselves paternity tests, extensive genealogical research, and a plentiful helping of luck, is usually required to identify the generation in which the NPE occurred, as such events typically leave little or no paper trail. Discoveries of this kind can certainly be unsettling, not so much for the person tested, as for the genealogist who has invested a lot of time developing his supposed ancestral line. But such discoveries, or at least suspicions, are routinely developed through genealogical research alone. yDNA testing in such cases can actually be valuable for their ability to resolve uncertaintites one way or the other. Besides, if there’s one thing that all real genealogists have in common, it’s the open-mindedness to follow the truth wherever it may lead. And speaking of leads, if the male JONES who was tested turns out to be a match to one or more SMITHs (in addition to, or instead of to other JONESes) the need to review one’s research for possible convergence between known JONESes and SMITHs (perhaps as neighbors, or having intrafamilial dealings) can open up new leads or avenues of investigation. This report, by Irish researcher Barry Bradfield, consists of a summary in descendant tree form of his Irish and Scottish research on the main line of titled and gentry Dennistons from their earliest appearance in the records of Scotland, down through their identifiable DNA-tested descendants. This report, by Irish researcher Barry Bradfield, presents a partial descendancy for Alexander Denniston of Drummeel, County Longford, Ireland, that focuses on the ancestries of DNA-tested DENNISON Patrilineage 1 project members Wayne-19, and Ronald-25. It is based on reasonably exhaustive search of the Irish records, and presents much of the scant Irish evidence, along with some from America as well. Although the report is focused particularly on the ancestry of Irish member Ronald Denniston, it ought to be of interest to any serious researchers of DENNISONs in Ireland. This report, by Irish researcher Barry Bradfield, presents extensive evidence on DENNISONs in County Tyrone, Ireland, and it ought to be of interest to any serious researchers of DENNISONs in Ireland. This is a very well researched descendancy of the immigrant, Daniel Denniston, the pioneer settler of AugustaCoVA in the 1730s, and ancestor of project members Alan-05, and Randle-22 (the author himself). It takes into consideration all the principal sources on the early generations in AugustaCo and its derivative, RockinghamCo, and follows the descendants of Daniel as most of them migrated to Kentucky and “points west” in subsequent generations. Some lines are worked out in full, and carried down to the present day. This work stands out from the mass of published amateur genealogies in at least two respects. First, and most important, the research on the early generations (the ones of the greatest interest to the greatest number of people) has been quite thorough, and partly for that reason, the conclusions are both judicious, and largely sound. Second, and most unusually for a work of this kind, detailed citations are provided for specific facts adduced. However, these are heavily abbreviated, and it is often far from clear whether the original primary (manuscript) source has been examined, or instead, the evidence has been gleaned from secondary sources of compiled abstracts. While for the most part such compilations are of fairly high quality, since they are, after all, abstracts, errors of both transcription and interpretation can creep in, and few collections of abstracts do an adequate job of describing, or even considering, the actual records context. It’s not always necessary to consult the actual primary sources, but it is always necessary to cite to the exact source one has consulted, so that those who make use of the published work can properly appreciate the thoroughness of the research, and make their own judgements about whether they had better check the primary sources themselves. This report, commissioned by project member Alan-05, focuses on the early generations of Alan’s descendancy from the same Daniel Denniston whose descendancy is the subject of Randle and Rachel Dennison’s book, RD, above. However, despite the fact that both the matter and the sources for these two studies substantially overlap, the present work is in no way based on the former, but represents a fresh look at the evidence, often at the primary records level, and includes detailed citations and analytical argument not found in the previous work, as well as a more detailed bibliography. The two works are linked in just one respect: after working out his own conclusions, the author carefully examined the corresponding parts of RD, and where supplemental material of interest was found, included this in quoted form, usually without comment, in his own work. Virtually all of this supplemental quoted material from RD concerns the grandchildren of Daniel the immigrant after they had migrated to Kentucky. The scope of JBR-DENNISON was largely confined to greater AugustaCoVA from the period of settlement in the 1730s until about 1800, though the one DENNISON family that remained in Augusta, that of John Dennison of Naked Creek, grandson of Daniel the immigrant, is followed down to about 1830. However, in addition, an effort was made to locate and account for all occurences of the surname DENNISON in the records of Augusta and it’s immediately derivative counties, and this expansion of scope has provided the basis for a reconstruction of the family of the John1 Denniston, a younger contemporary of Daniel1, and like him an early settler of AugustaCo. The author believes that this immigrant John1 to be the ancestor of project members Lane-01, her first cousin Russell-07, and other DENNISONs who moved on from early AugustaCo SW into the Virginia panhandle. This John may also have been the ancestor of John_A-04, whose line traces back to NE Tennessee, but further DNA testing, as well as additional genealogical research, will be needed to classify him. While the dovetailing of the circumstantial evidence for these two pioneering AugustaCo immigrants strongly suggests a close family relatioinship, the latest round of extensions of the DNA haplotypes of their descendants belies this supposition: it appears instead, that their mutual relationship was very remote indeed, as they evidently belong to two different DNA clusters within the Patrilineage 1 descendancy. Now that the majority of project members have extended their yDNA haplotypes to 111-markers, and since we also now have a comprehensive genealogical tree contributed by project member (and expert Irish genealogist) Barry Bradfield, that shows the deep ancestral relationships between a number of the members, it’s time to take stock of this new information, and provide a comprehensive analytical re-evaluation of the DNA results and what they tell us about the overall DENNISON Patrilineage 1 descent tree from the MRCPA of all members. Although the pairwise haplotype Genetic Distance (GD) comparisons that Family Tree DNA provides (e.g. 35/37, 108/111) are of little value as a measure of closeness of relationship (even when two 111-marker haplotypes are being compared), a matrix of the whole set of GD cross-comparisons for a large patrilineage can be usefully indicative of the shape and depth of the patrilineage as a whole—as long as the haplotypes included in the matrix represent highly divergent ancestries. The problem with single pairwise comparisons is that there just aren’t enough mutations or opportunities for mutation down both prongs of a pair of divergent descendancies to overcome the inherent lumpiness of the mutational process; or in statistical terms, the sample size is too small to yield significant results. However, with a matrix of pairwise 111-marker GD comparisons between at least five or six members of the same patrilineage that has been pruned down just to representative members whose mutual ancestries are highly divergent, one can derive a usefully close estimate for the time (in years or generations) back to the Most Recent Common patrilineal Ancestor (MRCA) of all. In addition, even a matrix which hasn’t been pruned down can, if its member rows and columns are intelligently arranged, provide some idea of the major clusters within the patrilineage, and how the outliers may, or may not be related to them. Thus, the plenary (unpruned) 111-marker GD matrix for DENNISON Patrilineage 1 indicates clearly enough that the largest single cluster centers around the haplotypes of Randle-22 and Dan-41 who descend from different sons of Daniel2 (Daniel1) of AugustaCoVA. Not coincidentally, this GD cluster corresponds to the Closer Cousin Cluster (CCC) that emerges from the analysis I make below of the specific mutational patterns of the project haplotypes. Sometimes CCCs can be spotted in well arranged GD matrices where the GD numbers trend down towards 0. The matrix also suggests a second such cluster grouped around the GD=1 value between Sean-29 and the project RPH, and as we shall later see, Sean happens to be a member of the Mainline Irish CCC as are the two haplotypes labeled “Barry-...” towards his top left—with the RPH itself constituting a boundary separator between the primary and secondary GD clusters of this matrix. So with this particular matrix we have a second yDNA-based method of possibly identifying a genealogically important cluster of likely related cousins even when there are no definitive shared (because inherited) mutations available to support a formal CCC classification. The GD matrix also shows that the haplotypes of three members, Russell-07, Patrick Balfour-32, and Levi-50 are outliers both with respect to the main lineages in the project, and also with respect to each other. Furthermore, the extreme divergence between them speaks to the extraordinary genealogical depth of this patrilineage, and improves the estimate we can make of the TMRCA of its founding ancestor. A pruned version of this matrix (replacing the several known closer cousins by a single representative) results in an average GD between the outliers of 9-10, and that in turn translates to an approximate birth date of the MRCA of all the tested members who’ve extended to 111, of about 1450, give or take a generation, or possibly two—thus to a birth date some time in the 15th century. The matrix also clearly shows that outlier Levi is closer to the Mainline Irish cluster than to the Daniel1 cluster, though it would be a mistake to put too much weight on the fact that he happens to be especially close to Sean. In the context of both the matrix and the project haplotype chart, to which I will turn next, that’s just because Sean’s haplotype happens to have experienced fewer downstream mutations than are to be expected—or than any of his Mainline Irish cousins. Before digging into this more genealogically focused analysis of the specific mutational patterns that run through this patrilineage, I would suggest that you open the project haplotype chart in a new window, so that you may better follow along with the references made below to the specific colored mutations in the chart. If you’ve just read through my analysis of the project 111-marker GD matrix you will already have encountered references in passing to CCCs as I was attempting to tease some meaning out of the GD patterning. Be aware, though, that even a large matrix of extended GD cross-comparisons can only offer suggestions: definitive classification by closer cousin cluster requires the emergence of shared, because inherited, mutations that link the members of each cluster. CCCs are defined by the occurrence of tested-for ySTR mutations at certain unpredictable nodes of the descendancy tree. Unfortunately, our only evidence regarding these mutational events lies in the tested haplotypes in which several such mutations may have accumulated, but their presence there provides us with no clues as to the generation in which the mutation actually occurred. When we find that two haplotypes share the same mutation, it’s likely that they inherited it from a more recent common ancestor than the MRCA they have in common with all the other project members. If this were always true, these shared mutations would qualify every sharer for the Closer Cousin Cluster designation. Unfortunately, though, the very markers most likely to mutate (the CDYs, DYS710, 712, 576 and others) are so mutable that across a good-sized patrilineage like this one, they sometimes mutate independently in more than one ancestral line; and when they do, two haplotypes that share one of these mutations do so by happenstance rather than by inheritance. The dilemma of inheritance versus independent mutation can usually be resolved, at least probabilistically, by taking the estimated mutation rates of the individual markers into account, and these can vary from one marker to the next by a factor of 50. I’ve provided a rough quantication of mutability for each marker by color coding the marker headings in the project haplotype chart—my color coding scheme is defined in the prefatory text. There are thus good markers and bad: the good ones (the one not colored some shade of red) rarely mutate, so are almost always indicative of a shared inherited mutation when they occur in two or more haplotypes. I’ve styled these defining mutations in the CCC classifications below; I’ve called the not so good mutations auxiliary mutations, because taken by themselves they may turn out to be red herrings down the road. There’s yet one more complication: there are several different kinds of mutation, each with different (and not always well known) mutation rates, and it’s not always clear which kind of mutation is responsible for what we observe in the haplotypes. I will pass over this highly technical issue here, except to note that the colored boxes in the haplotype chart that represent mutated marker values are color coded to reflect my interpretation of the kind of mutation each represents, and the color coding is decoded in the text immediately following the chart. Also, when we speak of mutation, the implication is that the marker value we’re talking about has mutated from its original value when it was part of the haplotype of the MRCA of all project members—or at least that it has changed from the supposed original haplotype, the RPH. Yet we can never know for sure what the original value of any particular marker was, or even whether the value we’re characterizing as a mutation wasn’t in fact the original value: we can only go by the probailities. Thus, if we have, say, six haplotypes known from their ancestral genealogical background to be highly divergent—with mutual common ancestors who lived only many generations ago—and one more such haplotype with a different value, the latter is likely to be the mutated value. In practice, it usually doesn’t matter too much whether we get this right: what matters is that since there are different values across the set of descendant haplotypes, mutations have occurred that allow us to sort them into CCCs. These various considerations complicate both CCC classification and the implications that be drawn from such classification. The best way to resolve many of these interpretive dilemmas is to take what is known of the genealogy into account, even though this contaminates the inferences with circularity. Although it can be illuminating to imagine two different descent trees, one of the genealogical kind, and the other consisting of a set of hierarchical mutational nodes that are inherited by subordinate nodes, it is by attempting to merge these two trees and consider all the evidence as a whole that we can come closest to the truth of the matter. The members of this cluster are: Sean Dennison-29 (i.e. Project Member# 29); the three haplotypes managed by project member Barry Bradfield (Sidney-12; Robert-13, and Ronald-25); Wayne-19; and probably our most recent member Levi-50. Three of these members (Sidney, Robert, and Ronald) also share the DYS439=13 mutation, suggesting that they constitute a cluster within a cluster. The ancestries of all the members of this CCC but Levi have been traced back to one John Denniston (born abt 1590, SO i’ll call him John1590) of the Scottish gentry and merchant classes. As this ancestral tree (put together by Irish genealogist Barry Bradfield) shows, this John1590 was a 12th generation descendant of Sir Hugh de Danzielstoun (abt 1250 - after 1300). It also shows that John had three sons: Archibald (abt 1618), William (abt 1619), and Robert (abt 1638—thus presumably by John’s second wife). Sidney, Robert, Ronald, and also Wayne are descended from John1590’s son William, while Sean is descended from John1590’s son Robert. We may infer, therefore, that the secondary mutation DYS439=13 (sported by Sidney, Robert, and Ronald, though not Wayne) occurred somewhere high up in the line of William (John1590) and perhaps even distinguishes William and all his patrilineal descendants. Anomalously, though, the other supposed William descendant, project member Wayne Denniston-19, is DYS439=15—that is, after the initial mutation, his DYS439 marker either mutated twice more back in the opposite direction, or, more likely experienced a single double-step mutation. This deep genealogical tree, and the 111-marker results we have for three of the five members of this cluster, provides an instructive example of the limitations of pairwise, merely mathematical TMRCA estimation, even for a pair of haplotypes fully extended to 111 markers. 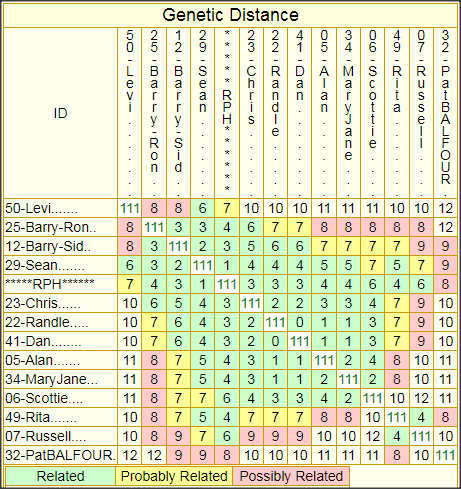 The 111-marker GD matrix shows that the average GD between Sean and his cousins Ron and Sidney, from whom he is known to be separated by 11 generations, is 3. Using that average number, the straightforward little TMRCA calculator I often use predicts a convergence between Sean and his cousins at 4.5 generations back, to a patriarch born say 1800. FTDNA’s TIP calculator, which is more sophisticated, but not necessarily more accurate (since the company hasn’t exposed the mutation rates its uses to public scrutiny) projects a 57% chance that Sean and Ronald’s ancestors converge at 5 generations, a 91% chance that they converge at 9 generations, and only a 3% chance that the MRCPA goes back the 11 generations that he actually does. The corresponding numbers for Sean and Sidney (also 11 generations divergent) are far worse: a 50% chance of convergence at 3 generations, and a 90% chance of convergence at 7. Of course, if we take advantage of TIP’s ability to be instructed that we know that the Sean and Ronald’s lineages don’t converge over the last 10 generations, it obligingly resets its prediction to a 38% chance that the common ancestor occurred by the 11th generation, and an 86% chance that he occurred by the 13th, but while this finally is close to the truth of the matter, it’s the genealogy, not the DNA, that’s doing all the work. The problem is that statistical estimates based on sampling rely on “the law of large numbers” to smooth out any lumpiness in the underlying phenomenon for which the probabiliatic estimate is being derived, and there just aren’t enough mutational opportunities in 111 markers times, say 10 generations, to smooth out the rare and sporadic nature of the mutational process: the sample size is just too small. The inherent mathematical limitations in TMRCA estimation can be overcome to a degree only by considering a decent sized matrix of many 111-marker haplotypes, and then the best we can do is to make comparisons between subsets of haplotypes—comparing one member to the average of all the others to get some idea of when that particular subject split off of the main tree; or comparing the average of all the members of a Closer Cousin Cluster (CCC) to the RPH (the project norm), to estimate when the CCC as a whole split off. Whole GD matrix analysis can also be useful in estimating the TMRCA of the MRCA of all the members, but the rule in all these cases is: the larger the set of extended haplotypes, and provided that they are known to be divergent (not closely related to each other), the more accurate the estimate. Last, but not least, we need to take other a priori factors into account when we have prior knowledge (statisticians call this “Bayesian inference”). In this case, the mere fact that a candidate for membership in a patrilineage whose GD is high with the known members (even considered “unrelated” by the FTDNA matching criteria) shares the common surname goes a long way to accepting him as related after all. Second, we need to take into consideration what we know of the genealogy of the people whose haplotypes we are subjecting to this statistical analysis—whether their ancestries are known to be divergent for a certain number of generations, and when and whether there are regions of spacetime in which their ancestries might have converged. Although technically, bringing in these other factors creates a degree of circularity in our reasoning (compromising the ability of the DNA to provide us with independent corroboration of our genealogical suppositions), what we are rather ambituously aiming at here is to reconstruct history from just a few scattered shards of one sort or another, and we need to take into consideration everything we can find or infer in order to intuitively build the best holistic reconstruction of what actually happened. I’ve called this BALFOUR Closer Cousin Cluster (CCC) a MetaCluster (MetaCCC), because it’s so far up the DENNISON Patrilineage 1 ancestral tree that it’s bound to incorporate one or more subordinate CCCs. And in fact I’ve provisionally defined just such a subordinate CCC below: the JOHN1 of AugustaCoVA cluster. At present, there are just two members of the BALFOUR MetaCCC: Patrick Balfour-32 and Russell Dennison-07, and Russell belongs to the JOHN1 CCC as well. If I am right about this classifications, that Russell Dennison and Patrick Balfour constitute a CCC, then any even closer cousins of Russell (any project members who likely descend from the same immigrant ancestor as Russell’s), should share the defining mutation of the BALFOUR cluster (DYS463=25) as well, and extending their haplotypes to 111 markers, as Russell’s has been, should go a long way towards confirming that they belong to the recent, and more genealogically significant JOHN1 CCC. Extending their haplotypes is also quite likely to turn up a better shared mutation than the current CDYa=35 to mark all the descendants of John1. For this reason, it would be highly desirable to extend project members John Allen Dennison-04, and new members Reda-48 and Rita-49 to 111 markers. As the project 111-marker GD matrix shows, the haplotypes of Patrick and Russell diverge by a GD (Genetic Distance) of 10, which by FTDNA’s overly restrictive criteria (which fail to take common surnames or genealogical evidence into account) they are “unrelated”. For that matter, Russell diverges from all the other members by an average GD of 9, which makes him on average just “possibly related”. But he is “probably related” to at least one other member, Sean-29, and his surname, often spelled in ancestral records with the Scottish “t”, pretty much removes all doubt that Russell belongs to DENNISON Patrilineage 1, without even considering the genealogical evidence that shows him turning up in the same remote corner of the world, and at about the same time, as undoubtable patrilineage member Daniel1 Denniston. Patrick Balfour-32, however, has a different surname, and though his ancestry also runs back to Scotland, more than that is needed to confirm that he too properly belongs to this patrilineage. The more comes in with the DYS463=25 mutation that Patrick shares with Russell: this marker mutates so rarely (once in every 2800 generational opportunities) that it was almost certainly inherited by both Patrick and Russell from a mutual MRCA (Most Recent Common Patrilineal Ancestor) not in the ancestry of any of the project members who have currently tested to 111 markers. A secondary indication that Patrick fits nicely into this patrilineage, and that he and Russell constitute a CCC, is the fact that both his and Russell’s haplotypes are closest in GD not to any particular tested member but to the project RPH—our best guess of what the haplotype of the MRCA of all members looked like, and the central axis from which all member haplotypes fan out as they accumulate mutations down the generations. We would naturally like to know just when this BALFOUR MRCA split off from the main DENNISTON ancestral tree, or in other words to determine its TMRCA—or, in the terms I prefer to work with, to come up with an estimate of the birth date of the MRCA whom Patrick and Russell so far uniquely share. Although, as I’ve explained at length elsewhere, TMRCA estimates, or marker matching ratios like 102/111, or mutual GD numbers between any given pair of haplotypes, are of little value in estimating their closeness of relationship, comparing the average GD across 111 markers of several members of a CCC with the project RPH can provide a TMRCA estimate that is accurate enough to have some genealogical value, and the more such CCC members there are to average, the more accurate the estimate, particularly if their ancestries are known from genealogical evidence to be highly divergent. In this case, even though only two members of this BALFOUR CCC have extended to 111 markers, both their known genealogies and their mutual GD tells us that their ancestries are highly divergent, so their average GD from the project RPH, which is 7, can be expected to produce an estimate for the birth date of their mutual MRCA that is accurate enough to be genealogically useful. And that estimate (using .0029 as the average probability for any one of those 111 markers to mutate in any given genetic transmission from one ancestral father to his son), yields an estimate for the birth date of their mutual MRCA of 1575, give or take a generation or two either way. My estimate of 1575 is also predicated on the assumption that the average length of a genealogical generation (the age of the father at the birth of his middle son) is 34 years. This paper shows that this is a reasonable assumption for most peoples and places, and it holds good for most of the known DENNISON lineages in this project. However, in analyzing these lineages I’ve encountered two exceptions. One is the ancestry from the patriarch of the Mainline Irish CCC (the John Denniston who was born about 1590) back to the first documented ancestor of this patrilineage: Sir Hugh de Danzielstoun, born about 1650: for this stretch of DENNISONs, the average generational interval is 28, not 34 years. The other exception pertains to the 8 generations of Patrick’s ancestry back to William the weaver of Glasgow, born 1734: for this ancestry the generational interval is again 28 years. That suggests that the GD-based estimate of 1575 for the birth date of the MRCA of Patrick and William, ought to be moved forward by ((34-28)/8)/2 = 24 years to about 1600, again, give or take a generation or two. On the genealogical side, the farthest we’ve been able to trace the ancestry of Russell Denniston or of any of his JOHN1 CCC closer cousins is to their putative immigrant ancestor, John1, who pioneered in Augusta County, Virginia, in the mid-1700s, while Patrick’s ancestry can, it appears, be traced with some confidence back just about as far from Canada, by way of northern Ireland, to the Glasgow area of Scotland. Thus, the genealogical evidence tells us that there were no opportunities for these two lineages to converge before about 1700. Any attempts to close the gap from there back to my revised GD-based TMRCA estimate of 1600 or a couple of generations before, must likewise depend on genealogical evidence, and I’ve considered and summarized what I’ve found of that in Scottish BALFOURs elsewhere on this page, and in more detail in a paper linked to that section. Finally, one interesting feature of Patrick’s haplotype is that his DYS504 marker has experienced the same mutation as the haplotype of Sid-12, yet Sid can hardly be a closer cousin of Patrick and Russell unless Sid’s DYS463 somehow mutated back to it’s original 24 value in just the dozen or so generations subsequent: but there’s only about 1 chance in 250 of that. The best alternative is that DYS504 just happened to mutate twice (independently) in both Patrick’s line after it split off from Russell, and Sid’s line down from his MRCA, John1590. Given that this happened to one of these two, the chances of it happening to a second haplotype in the project over the roughly 10 generations since are about 1 in 60—much better odds. We can do no better than go with the probabilities in cases like this when we have no better evidence to guide us—historians have that in common with scientists, most of whose findings are likewise based almost entirely on statistical evidence. Strictly speaking, there is no JOHN1 yDNA Closer Cousin Cluster (CCC) per se, because cluster is a plural noun and the only member of this cluster at present is project member Russell-07. My concept of a JOHN1 CCC is based primarily on the strong genealogical evidence that not only Russell and his known first cousin, project member Lane-01, but also long time member John Allen Dennison-04, and new members Reda-48 and Rita-49 all descend from DENNIS[T]ONs of the Virginia panhandle, whose ancestry runs back through Robert2 of WashingtonCo to his father, the AugustaCoVA pioneer, John1. The reason we can’t properly say that these members constitute a yDNA-based CCC is because of this group, only Russell has extended his haplotype to 111 markers, thus picking up not only the DYS463 mutation, which makes him and any of his putative closer cousins also a member of the BALFOUR MetaCluster, but also two other mutations, that one hopes might be definitive of a JOHN1 CCC because shared by his fellow descendants of John1 of AugustaCo. As the project haplotype chart shows, these additional mutations are DYS525=11, and DYS712=18. f we extend John Allen, Reda, and/or Rita to 111 markers I expect that we will find they share the BALFOUR MetaCCC mutation, DYS463=25, and if they do, given their convergnet genealogy, it will go a long way to also classifying them as descendants of John1, and so constituting a proper JOHN1 CCC. Even better would be if they match one or more of Russell’s other high order mutations, as that would give us one or two more specific markers that mark this CCC. Although DYS712 is a highly mutable marker, and thus not by itself definitive of membership in the JOHN1 CCC, combined with the CDYa=35 value that this little group of genealogically known closer cousins also share, the two markers in tandem would be definitive, and that could be quite valuable to the other descendants of this prolific branch of DENNISON Patrilineage 1 whose genealogical connection to this branch of the tree is less well founded. In fact, John Allen’s connection could certainly use this reinforcement, and by extending Reda and Rita too, we may turn up other downstream mutations that are characteristic, say of the extensive descendancy from Scott3 (Robert2, John1). It would also, I think, be desirable to extend Cindy-02, whose haplotype does not look like a match to this JOHN1 CCC, even though her genealogy makes her a descendant of Scott3: extending Cindy should resolve this contradiction definitively. This cluster, known genealogically to be descended from Daniel1 Denniston (the American immigrant, who first appears in Augusta County, Virginia, in the 1730s), or from a close cousin of Daniel1, now comprises six project members: Alan-05, Chris-23, Dan-41, Mary Jane Michael-34, Randle-22, and Scottie-06. All have the DYS533=14 and DYS549=13 mutations, and only Chris lacks the more volatile DYS576=17 mutation, which we must therefore assume mutated back to its original state of 18 since his line diverged from the others; Chris also uniquely has the DYS439=12 mutation (probably a multistep mutation) to distinguish him from the other members of this Daniel1 CCC, and this mutation too must have occurred downstream from his divergence. Overall, the members of this CCC each have from 0-2 additional mutations over the average of 8 generations since their lines diverged from each other, which is actually on the low end from the 5 mutations that the current mutation rate estimates predict. This might be either because those estimates are too high, or because for reasons unknown to the current science, certain patrilineages have abnormally high or low mutation rates. There is much speculation abroad among the experts and experienced yDNA interpreters regarding both possibilities. Of course the sample size here is still pretty low, so these results might just be a statistical anomaly that would be smoothed out by testing more male descendants surnamed DENNISON of this patrilineal cluster, the size of which we do not know. Randle and Dan have identical haplotypes and no extraneous mutations beyond the three that are distinctive of this cluster: thus, we may take their haplotypes to represent the common pattern for all. We also have very solid genealogies for both of these members of the cluster, as well as for Alan, and can say with a high degree of confidence that they descend from three different sons of Daniel2 (Daniel1)—Alan from William3; Randle from Thomas3; and Dan from James3. We may therefore presume that the three mutations that are distinctive of the Daniel1 CCC occurred at the latest in the genetic transmission from Daniel1 to his only known son Daniel2, and most likely all three also occurred upstream of Daniel1, and thus emanate from Ireland, as we suspect Daniel1 does himself. I should note that while the haplotypes of Randle and Dan are identical, Alan’s has the additional mutation DYS650=18, which becomes distinctive of his divergent line of descent at some point. Likewise, project members Scottie and Mary Jane, whose ancestries have now been shown to converge to John3 (Daniel2-1) through his son Samuel4, share a distinctive mutation, DYS505=13, for which the odds are 220 to 1 that they inherited from a common ancestor. Since their lines diverge in the 5th generation (they’re descended from different sons of Samuel4), this mutation therefore must have occurred either in the genetic transmission from Daniel2 to John3 (and should thus mark virtually all of John3’s descendants), or otherwise in the transmission from John3 to Samuel4 (and thus mark all of Samuel’s): testing a patrilineal descendant of one of John3’s other sons, John4 or Daniel4 would tell us which. Chris, as noted, lacks one of the three mutations characteristic of the Daniel1 CCC, and there is also one questionable link in his ancestral chain which runs through Daniel2’s son David3, through his son Wiley4, and grandson John5. But then the link from John5 to putative son (Chris’s known ancestor) George McDowell Denison, is questionable. It’s also true that Chris has experienced two additional mutations, and possibly three if his DYS439=12 value came from two separate single-step mutations. But I think I’ve called that one right as a multistep, and two mutations over 111 markers is well within the normal range for Chris’s six or seven generations of divergence from Daniel2. It does remain a possibility, though, that instead of being descended from David3, or any son of Daniel2, Chris’s branch of the family might derive from a close cousin of Daniel1 who emigrated later from Ireland. Of the 8 member haplotypes that have’t been extended to 111 markers, and can’t, therefore, be classified definitively by CCC solely on the basis of their DNA, since project member Lane-01 is known to be the first cousin of Russell-07 who has extended, there’s no reason to extend her as well. Unextended project members Robert-13 and Wayne-19 both have Irish ancestry that credibly link up with Barry’s descendancy tree, and both of these gentlemen also share the defining haplotype of the Mainline Irish cluster, DYS446=12, as well as other more volatile mutations, with their genealogically closer cousins, Sidney-12, and Ronald-25, respectively: these two can therefore also be with confidence classified as descendants of the Mainline Irish Cluster, and don’t need to be extended to 111 markers at the present time—though it’s if we acquire additional members of this CCC, extending them might help to sort out to further sort out their respective CCC sub-branches. The remaining five unextended members would all benefit both the project as a whole, and in some cases themselves, but extending to 111 markers. Now that I’ve taken the bold step of linking all the members with Virginia panhandle ancestries genealogically into a common ancestry that runs back through Robert2 of WashingtonCoVA to the pioneer immigrant John1 of AugustaCoVA, we really need to extend at least one of these three: Reda-48, Rita-49, and John Allen-04 to see whether any of them have mutations in the upper band that would match the two that Russell turned up (DYS525=11 and DYS712=18), and if they do, extending the other two would provide independent yDNA confirmation of this common ancestry. The haplotype of member Cindy-02 particularly needs to be extended, because at present it contradicts her genealogical evidence that points to a descent from the same ancestor that Russell and Reda share, Scott3 (Robert2, John1). Her haplotype has so many divergent mutations from this putative closer cousins, that the relationship cannot at present be credited, but if extending her brought her closer to these possible cousins, or better, matched to a newly discovered deginitive mutation for the putative JOHN1 cluster, it would finally resolve the dilemma of her lineage—or alternatively, it might show an affinity between her line and one of her more distant Irish-rooted cousins that could point to the need for additional, more comprehensive genealogical research on her line. Finally, there is the interesting case of Tee Branch. Tee’s haplotype lacks the auxiliary mutation that I’ve acknowledged for the putative JOHN1 CCC that runs through the Virginia panhandle, and her own ancestry is completely different: rooted in County Tyrone Ireland (one of the DENNISON Patrilineage 1 stomping grounds), though not part of the Mainline Irish CCC, and with an immigrant ancestor who came in during Ireland’s troubled 19th century and he and his descendants settled in the area of NY that borders VT and western MA. Interestingly, as the the project haplotype chart shows, Tee’s haplotype also shares the DYS570=18 mutation with JOHN1 cluster members, Reda, Rita, and John Allen, and also with the semi-orphaned Cindy. This DYS570, like the CDYs, is highly mutable and so is of dubious value for defining a CCC because it can so readily mutate independently in different lines, or evn mutate back to it’s original value, which may be why JOHN1 cluster member Russell-07 and his cousin Lane-01 lack this mutation. Still, this sharing of DYS570=18 is intriguing and might just mean that the JOHN1 of AugustaCoVA, the immigrant ancestor of so many members, also hailed from County Tyrone. In that case we would have two mutations to work with for the JOHN1 CCC: a DYS570=18 value that runs back to 17th century Ireland, and a CDY=35 mutation that was picked up in JOHN1’s ancestral line sometime after it split off from Tee’s, with Russell’s lack of the DYS570=18 explained by a back mutation to a highly mutable marker. Be all that as it may, if we extend Reda, Rita, and/or John Allen and discover that one of Russell’s two upper band mutations provides a definitive marker for the JOHN1 CCC, we would also want to extend Tee’s haplotype to see whether the same mutation also runs back to Ireland and thus defines a CCC that includes the JOHN1 CCC as a subset. Project member Alan-05 has agreed to be available as backup project administrator in case something happens to me, and he may also be involved with special project that may arise. However, all business of the project will continue to flow through me unless you are otherwise advised. The DNA results for new DENNISON Patrilineage 1 project member Wayne Earl Dennison (Wayne-19) have been posted, and his genealogy, which goes back to Grand Island, Erie Co NY, and thence (probably) to County Longford, Ireland, will be posted in due course. The DNA results for Scottie-06 are being extended to 67 markers. Scottie’s extension is thanks to Alan-05, who has made a donation to the General Fund for that purpose. If you are interested in helping to further the DNA side of the project by making a donation yourself, please read what I have posted on the General Fund, here. A couple of NPE matches have turned up to the haplotypes of patrilineage members Scottie-06, and Wayne-19. We may say that they are NPEs because they have different surnames than DENNISON (Balfour and Stone), and because there is now, courtesy of project member Barry, pretty good evidence that the Dennison-Denniston surname that runs in this bloodline goes back to the original gentry line of Scotland. Both of these NPEs have 67-marker results to compare to, so that when Scottie’s extension to 67 become available, we should have confirmation that they belong to the patrilineage, and I will contact them and offer them membership at that point. 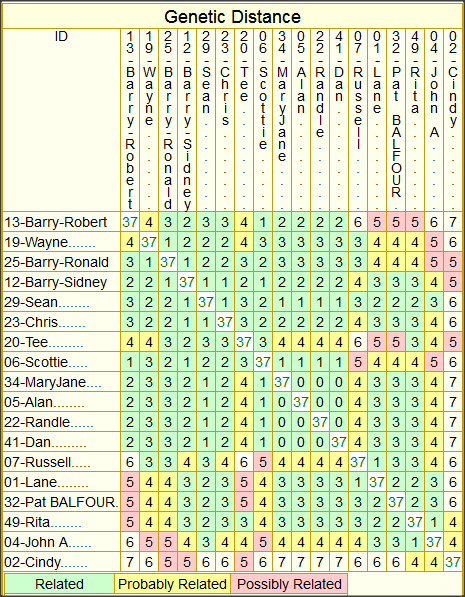 The DNA test results of extending Scottie-06, and Barry-13(Robert) from 37 to 67 markers have come in, and I have updated all the charts, and provided a new Patrilineage 1 Analysis, above. I have also added a few earliest known ancestral names to the Mutation History Tree. The ancestral pedigree (descendancy) for Wayne-19 has been posted. Please welcome new member Tee Branch (Tee-20) to the project. Her DENNISON ancestor appears to have emigrated to the U.S. from County Tyrone, Ireland, after 1850, settling in upstate New York. Please welcome new member Randle Dennison (Randle-22) to the project. Randle is the author of RD, a valuable book that follows the descendants of Daniel1 Denniston of Beverley Manor to Kentucky and “points west”. His DNA test results have proved to be identical to those of Alan-05, his fifth cousin once removed, and establish the paired mutations of DYS439=14 and DYS576-17 as markers for the descendancy of Daniel1. Please welcome new member Chris Dennison (Chris-23) to the project. Chris’s genealogy seems to show that he is a descendant of Daniel1 Denniston of Beverley Manor, through great-grandson Wiley4 (David3), but his DNA results essentially rule out a descendancy from Daniel1. Cindy-02’s haplotype has been extended to 67-markers and the results go some way toward bringing her back into the fold of SW Virginian DENNISONs, despite its still inordinate number of mutations, and the fact that it lacks the DYS439=13 mutation that is characteristic of this line. In particular the new results tighten her Genetic Distance relationship to John_A-04, who does have the DYS439=13 mutation, bringing John_A and Cindy solidly into the circle of probable relations. Consequently, I have significantly revised the mutation history tree to show Lane-01, her cousin Russell-07, John_A-04, and even Cindy-02, as descendants of a common ancestor—a contemporary of the Daniel1 Denniston of AugustaCo who is the ancestor of Alan-05, Randle-22, but probably not Scottie-06. Please welcome new member Ronald Denniston (a.k.a. Barry-25) to the project. Project member Barry Bradfield, who sponsored Ronald’s test, has traced Ronald’s line back to 1-Alexander (born abt 1663) of Drummeel, County Longford. Since my last update of this page there have been many new developments respecting DENNISON Patrilineage 1. First, we have acquired three new members: Sean Dennison (member# 29), who is Irish; Patrick Balfour (#34) who is a DENNISON despite an NPE that has affected his surname; and Mary Jane Michael, who is the genealogist for her husband’s Augusta County, Virginia, DENNISON ancestry, which evidently dovetails genealogically with that of Scottie and John E (member# 06). All three of these new members have turned out to be important keys to realizing this project’s ultimate goal: reconstructing the entire DENNISON Patrilineage 1 tree of descent from the ancient Scottish line—at least for the subset of its DNA-tested descendants. Of even greater importance than the mere acquisition of these new members is that these three and seven others have now extended their haplotypes to 111 markers, which has made it possible to identify several new shared mutations, which, with the ones already discovered, makes it possible to sort most of the members into what I have termed CCC (closer cousin clusters). Even better, these DNA-determined clusters correspond nicely with the extensive genealogical research that has accumulated for this patrilineage. Besides adding these individual DNA haplotype results to the project haplotype chart, I’ve created a 111-marker Genetic Distance matrix that shows the overall structure of closeness of relationship across the patrilineage. I’ve also rewritten my analysis of the DENNISON Patrilineage 1 DNA from scratch to reflect the CCC organizing concept, and I will be revising the Mutation History Tree (which presents the same DNA data in a graphical outline form) accordingly. Also of great importance, our expert Irish member, Barry Bradfield, who has extensively researched the Irish and Scottish roots of this ancient patrilineage, has provided us with a comprehensive ancestral tree that outlines the deep Irish and Scottish ancestries of many project members, and I have made use of this in my analysis of the new DNA results. I will also be drawing heavily on Barry’s chart in reworking the project Descendancies section (which comprises the posted ancestral pedigrees of the members), wherever possible extending backward and unifying individual pedigrees to bring them into line with what Barry has come up with. Because the volume of this Descendancies material has become so large, I intend to split it off to a separate “Descendancies” page, with an index that lists the members grouped by CCC under the heading of their most recent common patriarchal ancestor (MRCPA). I won’t be able to get around to this for a while though. Finally, we anticipate the addition of another member of the DANIEL1 CCC—apparently a descendant of the same John3 (Daniel2, Daniel1) line that it seems project members Scottie and MaryJane descend from—although the additional research that might finally indicate how to make their connection, remains to be done. The DNA test of this new member is supposedly in progress (though there are continuing difficulties getting him connected as a member to the project), so watch this Project NEWS space for updates on that. First, to follow up on the last item of news last year, the putatative additional descendant of the John3 (Daniel2, Daniel1) line turned out not to match to DENNISON Patrilineage 1 after all, although a DENNISON ancestor of his may well have been raised by DENNISON Patrilineage 1 father. It would appear that he is instead a DENNISON descendant in name only, but a biological BEATTY, due to an NPE somewhere up the line. We do, however, have a new member who belongs to the DANIEL1 CCC: that would be one Darren Denison, a descendant of James3 (Daniel2, Daniel1), whose principal genealogist is Dan Lander, member number D-41. I’ve appended Dan’s pedigree to the root provided by member Randle-22, who will no doubt incorporate this new finding into the revised version of his published book that he’s working on. Although the D-41 haplotype only covers the first 37 markers at present (leaving some several of the distinctive DANIEL1 CCC mutations unmatched) there are plans under way to extended it to 111 markers. The haplotype of newest project member Dan-41 has been extended to 111 markers like those of his five “closer cousins”, and I’ve rewritten my DNA-grounded analysis of the Daniel1 closer cousin cluster accordingly. We have acquired a new project member, Rita Deniston (member# D-49), whose genealogy as well as her 37-marker test results group her into a CCC (closer cousin cluster) with long time member John Allen Dennison (D-04). And the mutational pattern of the haplotypes of these two, as well as certain pieces of genealogical evidence, further group them into a CCC with long time members Lane (D-01), Russell (D-07), and just possibly Cindy (D-02), as descendants of Scott Denniston of the Virginia panhandle counties. In fact, it is primarily Scott Denniston, with his somewhat unusual given name, who provides a link to the TN DENNISONs. Since I’ve long supposed, on the evidence, that Scott, in turn, was the son of Robert2 DENNISON of WashingtonCoVA, who was himself the son of John1, the second early DENNISON immigrant of this patrilineage, I have now formalized these relationships by posting a new amalgamated descendancy tree for the AugustaCoVA immigrant John1 that shows the inter-relationships of all of these project members, John1’s putative descendants, and I’ve included in that tree Robert2’s younger brothers, James2 and John2, and filled out the large conjugal family of Robert2 based on my now exhaustive compilatons of the DENNISONs in the annual personal property tax records for Washington, Wythe, and many other Virginia counties. I will soon be publishing a report to support these attributions predicated on this and other evidence. I am also in the process of putting together a report that will link project members Scottie-06 and MaryJane-34 to their ancestor John3 (Daniel2, Daniel1). Finally, to reflect these developments, I’ve rewritten the section above titled “The Southwest Virginia DENNISONs”. First, please read A Declaration of Independence, below. It outlines a formal structural change that has been made to this ongoing project—one which need, however, have no effect on its nature or objectives. Since the last news update in April, three new members have been incorporated into the DENNISON Patrilineage 1 project, whom I will consider in turn. First, Reda Smith (project# D-48) and Rita Denniston (#D-49) not only have convergent genealogies, they also share a mutational profile through the first 37 markers (as far as they’ve tested so far) both with each other, and with several other members of the project, all of whom have similar, if not necessarily convergent genealogies. In particular, Reda, Rita, and long time project members Lane (#01), her first cousin Russell Dennison (#07), and John Allen Dennison (#04) all share the CDYa=35 mutation, and Reda, Rita, and John Allen also share the mutation DYS570=18. These three also share DYS570=18 with two other members, Cindy (#02) and Tee (#20). Reda and Rita actually have identical haplotypes, at least through the first 37 markers (as far as they’ve tested so far), but, contrary to what FTDNA implies and people with limited experience with yDNA interpretation believe, paired haplotype comparisons are not reliable indicators of genealogical closeness. What does group yDNA-tested people together are sets of shared mutations, becuase these typically indicate that they were inherited from a MRCA (Most Recent Common Ancestor) who is closer to the bearers of these mutations than to any of the other patrilineage members, and who therefore consitute a Closer Cousin Cluster (CCC). Unfortunately, the very markers that are most likely to mutate, which include the CDYs, and DYS570, mutate so readily that they can easily do so in several different distantly related branches of a patrilineage, and thus create the misleading impression that all of their bearers belong to the same CCC. Despite this caveat, there are solid genealogical grounds for believing that Reda, Rita, John Allen, Lane and Russell, and possibly also Cindy (if not Tee) belong to the same CCC. Reda, Lane, and Russell, all have solid pedigrees back to the Scott Denniston who lived most of his life in the Virginia panhandle and died in RussellCoVA in 1882, and Rita and John Allen likely descend from different brothers of Scott. Cindy also has a pedigree that goes back to Scott, though her haplotype is otherwise so replete with mutations that there is some doubt that she belongs to this CCC. On the DNA side, the fact that Reda, Rita, and John Allen share the mutation DYS570=18, helps buttress this CCC grouping, even though Lane and Russell, their putative closer cousins, do not. DYS570 is so mutable that it can easily have mutated back to its original unmutated value since Lane and Russell diverged from the others genealogically. Accordingly, I’ve defined a new JOHN1 CCC to provisionally accomodate all of the likely closer cousins who have genealogical roots in or near the Virginia panhandle. Nonetheless, it would be highly desirable to get Reda, Rita, and John Allen extended to 111 markers to nail down their membership in the JOHN1 CCC, and to turn up other (and hopefully better) shared mutations that can be used in the future to differentiate between closer cousins of this lot, from others who happen to have picked up some of the same mutations. As I noted in my 15Apr2018 update, the emergence of these new descendants of the DENNISON families of the SW Virginia panhandle has inspired me to finally pull together the research on these families I’ve been accumulating for many years, and to post a comprehensive descendancy for this line from the AugustaCoVA pioneer, John1 Denniston. Reda, like member Cindy (#02), has contributed a rather extensive descendancy tree for her line from Scott as well as some key marriage records and the particular ancestral line of her DENNISON cousin is very solid. In the process of validating Reda’s line, I’ve reorganized and consolidated all of my USCensus abstracts for these VA panhandle families into a pretty comprehensive report titled “DENNISONS of Southwest Virginia in the USCensus...” (posted like most of my other DENNISON research as a link from the DENNISON Surname page). I’ve also made a thorough re-evaluation of my earlier posting of the conjugal family of Robert2 Dennisont of WashingtonCoVA, the father of Scott and other sons who are ancestors of these CCC members, and posted those changes to the descendancy tree for John1. Quite a while ago we acquired as a project member one Patrick Balfour, whose own yDNA unexpectedly showed that he was a biological DENNISON of this patrilineage, even though he has quite deep, and deeply divergent, Scottish BALFOUR roots. Patrick sent me a huge compendium of (mostly unevidenced) BALFOUR history, and he has since extended his haplotype to 111 markers, and I have until now, not taken adequate account of these things. As it turns out, though, Patrick’s extended haplotype shows him to be a closer cousin of Russell of the JOHN1 CCC, by virtue of the solid gold mutation DYS463=25. This marker mutates so rarely that the odds that it mutated independently in both Patrick’s and Russell’s line are on the order of 200 to 1. What membership in this BALFOUR cluster means is that both Russell and Patrick descend from a side branch of the DENNISON Patrilineage 1 main line that (my yDNA analysis shows) probably split off in Scotland sometime in the 1500s. It also means that all the legitimate members of the JOHN1 CCC should also be members of the BALFOUR cluster, which I’ve therefore styled a MetaCCC. And even if the putative JOHN1 CCC members whom I’m urging now to extend to 111 markers, should fail to turn up additional, better mutations that they have in common with Russell, they can at least expect to share the mutation DYS463=25 which will confirm their common lineage conclusively. Naturally, we would like to know just when and where this BALFOUR-DENNISTON line split off from the main tree in Scotland, as it might help to link the immigrant MRCA of the JOHN1 CCC to his Old World roots in either Ireland or Scotland. Irish genealogist member Barry Bradfield has long since suggested a couple of segments of Scottish spacetime where BALFOURs and DENNISTONs may have come together, and I have now made a detailed analysis of the BALFOUR material Patrick sent me as well as other Scottish BALFOUR evidence, and have written up my BALFOUR CCC DNA analysis, provided an overview of the evidence regarding Patrick’s Scottish BALFOURs, and also published a detailed analytical paper “Possible BALFOUR-DENNISTON Connections in Scotland”. Last, but certainly not least, we now have a new member of DENNISTON Patrilineage 1 by the name of Levi Deniston (#D-50) whose DENNISON ancestry traces back through Ohio directly to Pennsylvania, with at most only brief stops in Virginia and Kentucky. I’ve written more about this and other PA DENNISON lines in the new Pennsyvania DENNISONs section of this page, and noted there that the advent of this new Pennsylvania-based member has provoked me to extend and update the several compilations of PENNSYLVANIA Dennison evidence I published years ago (the links for which will be found in the “DENNISON Genealogical Resources & Evidence” section of the DENNISON Surname umbrella page). I’ve also now published an analytical report focused on Levi’s particular ancestry. I’ve now completed the exhaustive research project I first undertook some time ago on the Virginia descendancy of the oldest of Daniel2’s sons, John3—the one of Daniel’s sons who remained behind in Rockingham, then Augusta county, after Daniel and his other sons had all removed to Kentucky. My principal research report on John3 DENNISON of AugustaCoVA and his descendants, presents my conclusions in the form of an indented descendancy tree, supplemented by some 20 pages of analysis. The detailed evidential backing for those conclusions, with specific citations to the (mostly) primary records sources this research has been based on, are presented in this Evidential TIMELINE that tracks John3 and his descendants in Virginia through about the time of the Civil War. The TIMELINE, in turn, links to a number of supplementary evidential reports covering particular records categories, and for those with sufficient interest in this line, I’m prepared to provide them with images of many of the most important pieces of primary records evidence via CD. My research establishes conclusively that project members Scottie-06 and Mary Jane-34 descend from different sons of Samuel4 Dennison, respectively John5 and James A5 Dennison, who were presumably half brothers—sons of Samuel’s two successive wives. That these two were both the sons of Samuel4 has long been suggested both by the circumstantial evidence, and by the mutational pattern of their ySTR DNA haplotypes, once extended to 111 markers, but my research and analysis has both strenthened the circumstantial case and adduced direct evidence of these relationships. Accordingly, I’ve merged the posted ancestries of Scottie and Mary Jane into the master tree of descent from Daniel1. As elsewhere on this page, clicking their project member numbers will take you to their posted lineages. The deep digging I’ve done into the county records, and the thorough examination of certain chancery cases adjudicated in the Augusta and Rockingham County courts, have also turned up additional scraps of genealogical date—for example, that John3’s son John4 (Samuel4’s brother), was probably given the full name John K[ing?] Dennison, and that a fuller abbreviation of Samuel’s middle initial, “M”, is actually “Mc”, presumably for a surname beginning with “Mc” or “Mac”. This material, the chancery suits, and the complete compilation and analysis I’ve made of the deeds and other records of these Virginia DENNISONs also provide additional color for fleshing out these otherwise forgotten lives, and I’ve also, in my analytical report, indulged in some interpretive speculation towards those ends. Family Tree DNA has unilaterally implemented a phalanx of new rules governing the administration of its surname projects that in effect cripple them for genealogical purposes. The rationale for these changes was the decision by FTDNA to gratuitously comply with the new one-size-fits-all GDPR privacy rules imposed by EU bureaucrats on EU citizens. As such, these GDPR rules do not apply in any way to the vast majority of FTDNA’s customers, who are American. But that’s not the worst of it. FTDNA’s interpretation of GDPR and the typically ham-handed way the company has chosen to implement its interpretation has made it impossible for volunteer unpaid FTDNA Surname Project administrators such as myself, to carry on open, public, genealogical projects such as the present one. Fortunately, this patrilineage project and its DENNISON surname page umbrella have always been independent of FTDNA, and our membership rules have always been predicated on the willingness of candidate principal genealogist members to share both their ancestral surname pedigrees and the interpreted results of their yDNA test—and to provide an email address so that they may be contacted by other researchers interested in their common lineage. The email address isn’t openly displayed on the page, but it’s made accessible through their entry in the Directory of Researchers by following a simple procedure outlined there. All of these rules are designed to promote and encourage active, perhaps even collaborative, research, and to attract to the project, and where possible to yDNA testing, all the best research and researchers of the patrilineage. As a result of these new FTDNA rules, the plug has been pulled on the thousands of surname projects once hosted independently at World Families Network, and the default FTDNA project pages that these projects have had to fall back on have been made to a large extent dysfunctional as well—not that they were ever of more than minmal use. In fact, the default now is that project administrators don’t even have access to the test results of new members, and changing this requires talking the member through a complicated procedure to change certain of the project defaults. In order to preserve and carry on the many years of hard work that have been put into the DENNISON patrilineage projects I have from the beginning factored the DENNISON Surname Project into, it will be necessary for me to resign the administration of FTDNA’s now dysfunctional version of this project, as soon as I can find a suitable replacement. However, nothing that we are doing in these DENNISON patrilineage projects need change. I have renamed the old umbrella DENNISON Surname page to The DENNISON Surname Patrilineages Association (DenSPA) page, and I’ve outlined there, in full, the rationale for this new structure. I’ve also made more explicit the rules that govern each of the DENNISON patrilineage projects, in the To Join this Project section of this patrilineage project page, and I will be asking all new applicant members to read and assent to the requirements outlined there. Since all existing principal genealogists members of these patrilineage projects have already agreed to these rules, their membership will continue as before. Since these DENNISON pages already have a high profile on the internet, I expect that they will continue to be an effective recruitment tool, and as long as whoever succeeds me as FTDNA DENNISON Surname Project administrator agrees with our goals and recommends that new members of the FTDNA project apply also to join DenSPA and whatever individual patrilineage project they may fit into, I expect that the growth in these projects that benefits existing members will continue for as long as FTDNA or some other company continues to offer suitable yDNA (ySTR) tests. The following matrices, one for 37-marker comparisons, and one for 111-marker comparisons (for those project members who have extended to 111) provide some idea of the closeness of relationship across the full set of tested members of this patrilineage. The cell at the intersection of each column/row pair shows the GD (Genetic Distance) between the pair—this is an imperfect count of the total number of mutations that have occurred in both lines of descent since their MRCPA (Most Recent Common Patrilineal Ancestor) walked the earth. It’s also possible to create corresponding matrices that show TMRCA (Time back to the MRCA, expressed either in generations or in years), but I’ve decided to forgo such charts because they are just too misleading as indicators of when a particular MRCA lived. Mutations are so sporadic and infrequent (even when a large number of markers is tested) that such estimates can easily be off by many hundreds of years. If one has the irresistable urge to play around with TMRCA estimates between particular haplotype pairs, the best way to indulge it is to run the FTDNA Tip calculator for that pair from one’s personal page—but be sure to input the number of generations for which one knows, genealogically, the bearers of these haplotypes cannot have had a common ancestor. Color-coding shows whether a haplotype pair Definitely, Probably, or just Possibly belongs to the patrilineage. The number in each cell is the number of divergent mutations between each pair of haplotypes. The lowest numbers represent the closest relationships. Whether an outlier haplotype belongs to the same patrilineage should be judged by its lowest GD number. 1 or 2 can reasonably be subtracted from the indicated GD in assessing whether an outlying haplotype belongs to the patrilineage. 2 or 3 can reasonably be subtracted from the indicated GD in assessing whether an outlying haplotype belongs to the patrilineage. The chart below shows the haplotypes for each tested project member of this patrilineage. The colored marker value boxes are the ones that have mutated. I’ve decapitated most of the marker header names (e.g. “DYS393” has been truncated to just “393”), and color coded them to indicate mutability. Thus, [DYS]439 is a fast mutator, [DYS]458 is faster still, and CDYa&b are blazing, while [DYS]393 is slow and rarely mutates. The remaining markers fall into the midrange of mutability. The mutability of individual markers is important because it’s the shared inherited mutations that identify the Closer Cousin Clusters which it’s the main purpose of testing to ascertain. And when shared mutations are to faster mutators, there’s a fair chance that some may have mutated independently in different lines, and thus weren’t inherited from a common ancestor. The chart scrolls to the right to show tested markers beyond the first 37. A synthetic Root Prototype Haplotype (RPH) has been constructed to represent the most likely (unmutated) haplotype of the Most Recent Common Patriarchal Ancestor (MRCPA) of all the members of this project. In most cases the marker values of this RPH are those which are the most common across all of the haplotypes. Marker values that deviate from those of the RPH are deemed to be mutations, and are highlighted in lime green—or tomato, for multistep mutations. Markers with null values, due to deletions, are rendered in dark seagreen. Where the multicopy markers DYS464 and YCA (each taken as a whole) diverge in value from those of the RPH, the whole adjacent set of values will be colored yellow green, and will be counted as a single mutation. In the same way, reclOH mutations, which may affect several blocks of separated markers, will be colored orange and treated all as a single mutation when calculating Genetic Distance. You may click on a highlighted Project Member # (like D-05 for member Alan) to see the posted pedigree for that particular test subject. Clicking on the name of the Principal Genealogist, like Alan Denison brings up his entry in the Directory of Researchers, and clicking on his full name in the Directory brings up an email blank addressed to him. The Earliest Known Patrilineal Ancestor (and/or his data) is as projected by the editor (JBR), and may not reflect the opinion of the Principal Genealogist of that line.